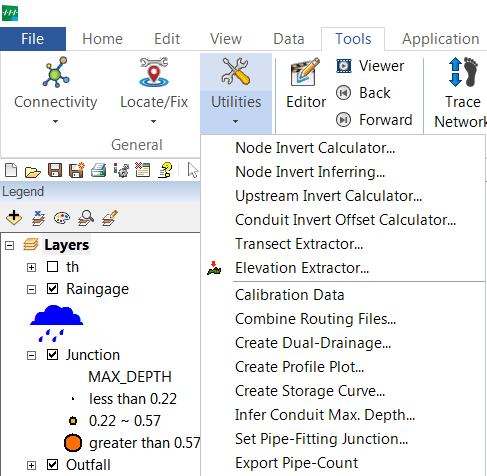 Fill Pipe Connectivity – Based on a user defined tolerance and subsequent parameters, fills the connectivity information for all InfoSWMM SA pipes based on the graphic overlap of the selected pipes. This tool is used to “weed out” very small pipes that connect two nodes that are very close together. After running this command, use the Orphan Nodes and Orphan Pipes commands. 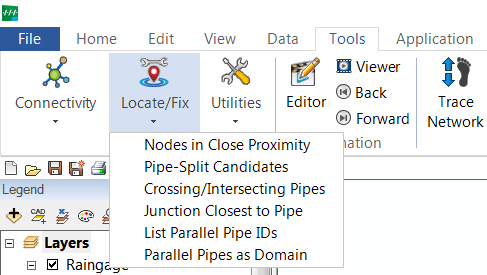 To use Animation, go to the InfoSWMM SA Ribbon -> InfoSWMM SA Tools and select Animation. There the user will see the following options for Animation: Animation Editorand Animation Viewer. Trace Connected Nodes – The Trace Connected Nodes function launches a spanning tree to identify all nodes in the network that can be reached from any specified source or target node via a connected path. The source node does not need to be a tank or reservoir. This function allows the user to instantly view all nodes of the network model that are disconnected from other nodes as shown in the figure below. The user can then easily determine if a hydraulic connection actually exists and, if so, make the connection in the model. The connected nodes will be placed in a domain and highlighted on the map. To remove the highlight, go to InfoSWMM SA Ribbon -> InfoSWMM SA and select the Clear button.